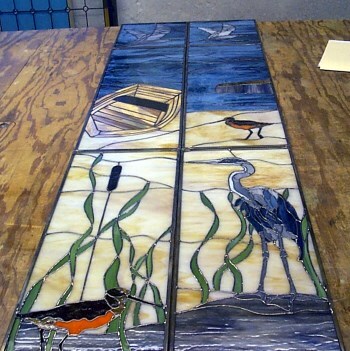 Living near the Chesapeake Bay brings us many requests for shoreline themes in glass. 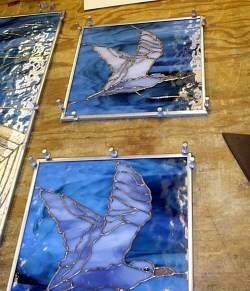 A client wanted stained glass inserts placed into a bathroom door. The theme of the glass needed to match the mural they had painted on the walls of the room; naturally, it was the Chesapeake Bay water life. While visiting the client and taking accurate measurements of the doors' openings, we also shot a photo of the mural while I was there in order to bring it back and place it as a background image in Glass Eye 2000. The software makes it easy to make notes on the background which the customer emphasized during the visit also allowing avoidance of mistakes while drawing the panels. 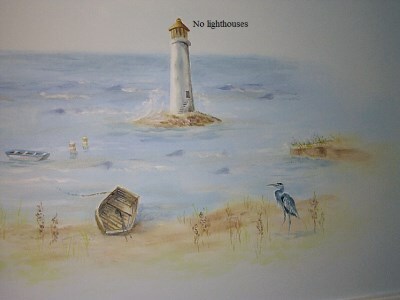 This time, the client did NOT want any lighthouses included in the glass panels. The boat, some grasses, a blue heron, two seagulls flying, and two sandpipers were a must, so we began drawing. After several revisions, the client was very enthusiastic about the design. We dropped in on the client again to decide on the glass colors, which, again, Glass Eye 2000 makes easy for us to show the client switching in and out of selections and coming to a final decision. We also did final measurements on the openings and the separations between the openings in order to make sure that all the diagonals and horizontal lines "tracked" from panel to panel. Due to the smallness of the overall openings, made even smaller by needing to use 3/8" u-flat zinc came framing, we knew some pieces would be very small, but in that the panels were all at "eye" level (so to speak) and not viewed at a distance, the tiny detail pieces were necessary to complete the scene.